As much as the kitchen in our first house was stuck in the 70's, the kitchen in our second house was stuck in the 80's or early 90's. Someone clearly had a hunter green fetish - it was on the counters, the floors, the curtains, and as we remodeled, we even found traces of hunter green wallpaper. Nice. 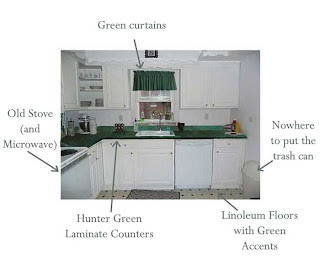 Besides the greenness of the kitchen, I was really bothered by parts of it that were really non-functional. It was such a small space that I really wanted to use every inch wisely. 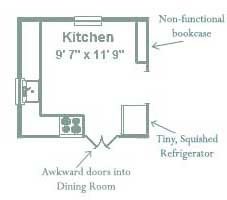 The refrigerator and refrigerator cabinet were tiny, and the bookcase on the back wall was so narrow it was useless. There was nowhere to put the trash can except out in the middle of the floor, and the doorway into the dining room was awkward. 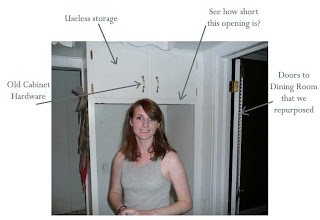 Sorry - this is the only "before" photo I have of the old refrigerator opening. Excuse my lovely outfit and hairdo. You can see how tiny the opening was - we definitely weren't fitting a side-by-side refrigerator in there. You can also see the doors into the dining room. So, we knew we wanted to change the layout around a little. We knew we wanted to fit a side-by-side refrigerator in here somehow. 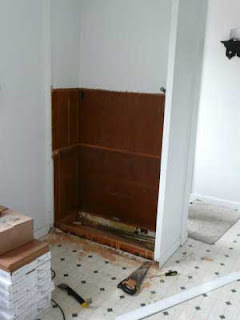 We wanted to replace the floors, the counters, the stove and microwave, the hardware, the faucet, and the backsplash. We wanted to find a place for the trash can. And after learning quite a bit from our last kitchen remodel, we knew we wanted to do it all on a teeny, tiny budget. I'm going to stop here and I'll plan to dig out photos of the "after" so I can show you what we did! You have such a wonderful blog. I love your ruffled chairs! Thanks! I'm a fan of yours, too!